Educate and prepare our neighbors within these communities for emergencies and disasters. Maintain readiness through training service. Support the men and women in these police departments when called upon. We have found in every situation, anyone who has completed the CERT Basic Training can contribute, regardless of their age or physical abilities. Each Team member adds to the camaraderie, spirit, and abilities of the Team. In a disaster situation, we focus on doing the most good for the most people and everyone can share in that outcome. Our Team participates in many community activities and events throughout our area. From Neighbor 4 Neighbor block based neighbor introduction programs to fairs and festivals; and from parades to service events like filling sand bags, West Orange County CERT works to keep a high profile and awareness of emergency safety and disaster preparedness. One of our CERT Program focus points is community training. 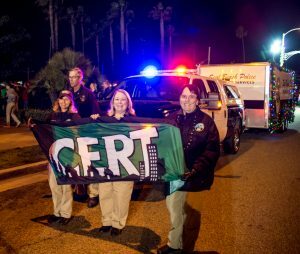 We coordinate and organize training events like our CERT Basic Training to help our community members to better understand what will happen in a widespread emergency event and how they and their family members can be better prepared for it. Our training events are generally free of charge. Please see our Training page for more information and details.